Following on from our deliberations on the weir (or 'water fall') at Croxton, here's a section from an old Ordnance Survey map of 1909 (with additions to 1938), showing the location of the flint mill adjacent to the aqueduct where the Trent & Mersey canal crosses over the River Dane. It is, of course, just our luck that the weir itself is a matter of millimetres off the map, as are the buildings we are trying to identify - in particular that large house which appears to have stood on the river bank close to the weir. Our problem being, of course, that the house in the photo appears to be too close to the river bank to be Croxton Hall Farm. Is it just a foreshortening effect? It's certainly not the farm which is there now. 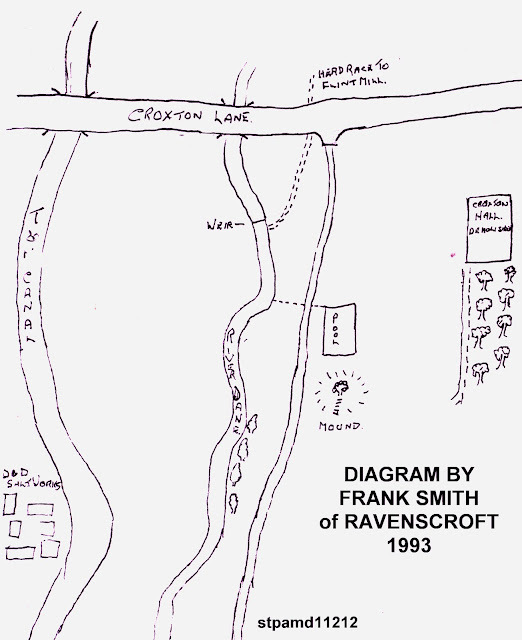 But, in the end, we have to conclude that the large house shown here must be the original Croxton Hall Farm. What else could it be? 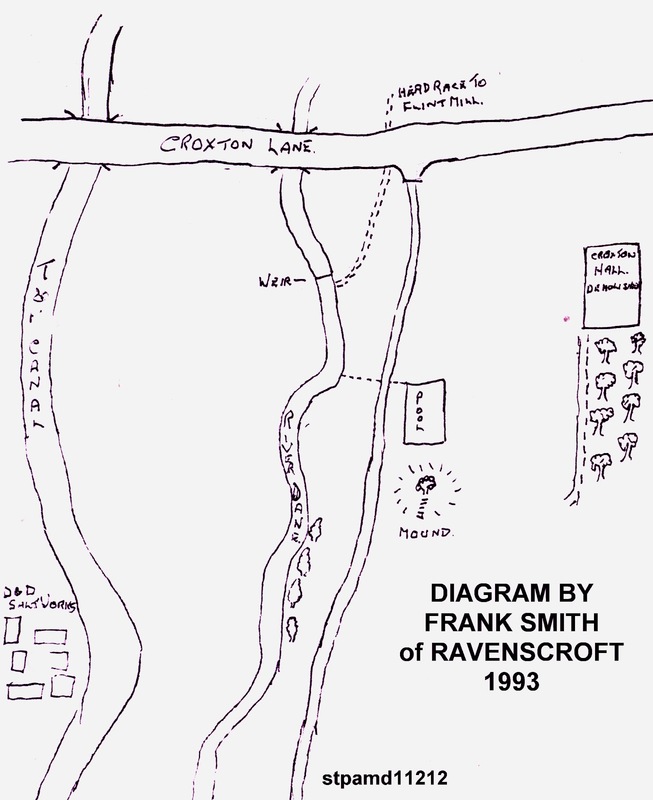 The original purpose of Frank's diagram was to explain the large mound still to be seen (from the Croxton Lane Bridge) in the field next to the river. At one time there was an ornamental pool﻿ close to this mound, stocked with fish and fed from the River Dane, as shown. 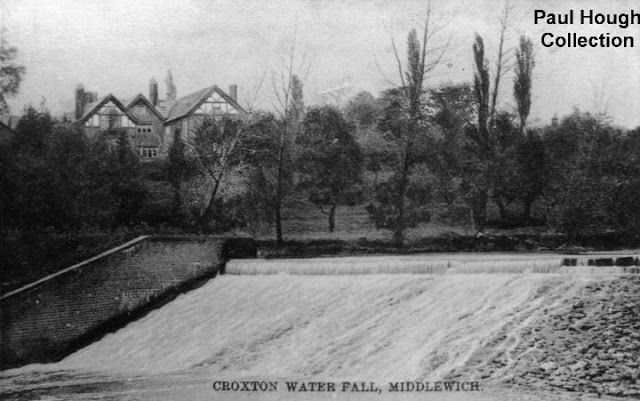 Frank's theory was that the well-to-do inhabitants of Croxton Hall Farm would sit on the mound on warm summer evenings and enjoy the sight of the pool and the surrounding countryside. The mound was made up of the earth excavated to make the pool, which was filled in during the 1950s by silt from 'the ICI reservoir'. A row of poplar trees was planted along the river's edge to screen the salt works (marked here as 'D & D' salt works) from view. The 'D& D' Salt Works, by the way, is the 'Dairy & Domestic' Salt Works, which was adjacent to the Condensed Milk Factory alongside the Trent & Mersey canal. It was at its most extensive in the late 19th century, and we looked at the last remnants of it here. Waterside Way and adjacent developments have now obliterated all traces of it.